Fieldpine Retail Solutions for store automation, Point Of Sale (POS), inventory and stock management, customer management, loyalty programs and analytical reporting. Available as private in-house systems, fully online cloud based or a combination of the two. 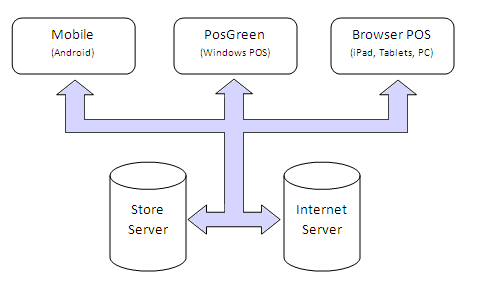 Smaller retailers with one store can download a Store Server. Fieldpine Retail is available in a number of configurations and you can mix and match components to suit what you require. It is a hybrid system, capable of operating "in-house", "cloud", or both at the same time. Sales Capture can use PosGreen where a highly reliable checkout approach is required. This can be suplmented with tablets or even mobile selling apps if these fit your needs better. Transactions from all devices are stored in Store Servers or Internet servers, or both. How long is the contract? There is no minimum or maximum periods, it is a pay as you go (and grow) approach. Can I credit montly payments towards a purchase if I decide to buy. No. What happens if I miss payments? The system will operate for 3 months before switching to read only mode. You must catch up all outstanding payments. Controls a whole store and coordinates multiple lanes within a single store, also to communicate to other store servers in remote stores. Cpu Restrictions None None None ..distributed.. Most reports can already be downloaded and saved as Excel spreadsheets, but our Excel Addin for Fieldpine takes this to the next level and allows you to create spreadsheets containing formulas that read information directly from your Retail System. If your requirements for products or customers exceed the limits for PosGreen Entry or Store Server Entry you can unlock an extended limit. The hire module adds the functionality for small hire shops to rent items, track hire and returns, manage memberships.